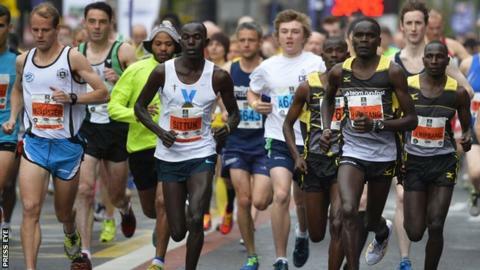 Kenyan Freddy Sittuk took victory in Monday's Belfast Marathon as he clocked two hours 18 minutes and 30 seconds. Sittuk, 32, was over three minutes ahead of compatriot and last year's winner Joel Kipsang (2:21:40) with another Kenyan Hilary Kipsang third. Joe McAlister was the first Northern Irish finisher as he clocked 2:33.09. Ethiopian Bayrush Shiferaw took the women's event in 2:41:20 while Kildare man Patrick Monahan won the wheelchair race in a huge personal best. Naas native Monahan's time of 2:06:21 cut over 32 minutes off the time he set on his marathon debut when he finished third in Dublin last autumn. Monahan first sat in a racing wheelchair last August. A car crash six years ago confined him to a wheelchair and he only started to compete last autumn. Ethiopian Shiferaw finished 12 minutes ahead of Scotland's Shona Crombie-Hicks in the women's event despite missing the scheduled start by around a minute after mix-up. The African regained her composure to dominate the women's race and her winning time was only two minutes and 33 seconds outside her personal best set in Annecy, France in 2011. Northern Ireland athlete Karen Alexander also ducked under three hours as she clocked 2:58 to take third spot. Sittuk, who was third in last year's race, broke clear of the other leaders at the 18-mile mark in Monday's race. The 32-year-old continued to extend his lead for the remainder of the race as he finished three minutes and 10 seconds ahead of Joel Kipsang, with Hilary Kipsang a further 28 seconds in arrears. Sittuk's winning time was almost four minutes outside his personal best set in Morocco four years ago.